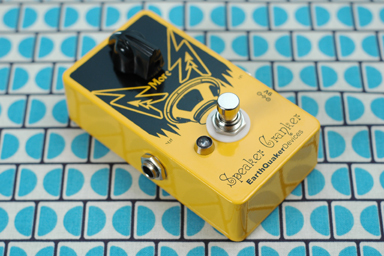 The Speaker Cranker is an all discrete dirt enhancement device designed to give your amp some grit and a slight boost without drastically changing the character or tone of your set up. It’s perfect for those that don’t like to fiddle with pesky controls yet want to add a little tube-like breakup or enhance an already over driven amp (or pedal) to give it some extra crunch without over loading the preamp. The single “More” control allows you choose the amount of break up you desire. Just like you would with a tube amp, back it off to thin out the sound and clean it up or crank it up for a fuller sound with a bit of compression.